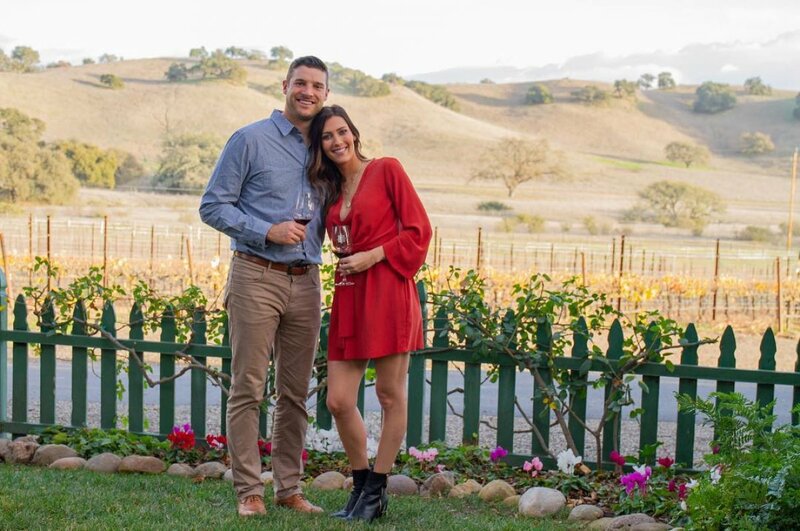 Becca gushed about having spent the last year with Garrett, who won her First Impression Rose as well as her last rose on The Bachelorette, on Friday on Instagram. Becca revealed in her heartfelt post that Garrett had won her heart in the very beginning of the ABC reality dating series. "From the pool to the pier, so much has happened in 1 year. @gy_yrigoyen, we have spent 365 days around the sun, and I can't wait for thousands more to come," Becca captioned a photo of the couple fishing on the pier, alongside a picture of them fishing in The Bachelor mansion's pool on Night 1 of filming. "Who would have thought that one soccer ball-smelling mini van and a single impression rose would change our lifetimes? You had my heart since the very beginning, and I love and value you so much." Becca added, "Thank you for this past year, thank you for simply being you. Now let's get a puppy for that mini van already!" Garrett also honored the occasion by sharing an Instagram photo of Becca handing him the First Impression Rose last year. "One year ago when I learned what the first impression rose was," Garrett joked. Becca and the medical sales representative from Reno, NV, got engaged on The Bachelorette's fourteenth season in August 2018. Becca said goodbye to Minneapolis, MN, at the start of 2019 to start a new life with her fiance in California. Last month, the couple enjoyed a skydiving adventure together and revealed to Entertainment Tonight the latest on their wedding plans -- or lack thereof. "We felt like we're still at the point we're getting to know each other, because we've been together 24/7 so we know each other, but we want to have a long engagement and do our own thing and not be on anyone else's timing," Becca explained. "A lot of people throw out, 'Get married, have a big wedding, have it be televised, have babies!' and we're like, 'We're gonna do us.' If we were to meet in a normal daily setting and date normally, I think we would still extend that, so we're just trying to keep that going." The pair, however, insisted they are happy together in San Diego. "I didn't want to live in L.A.," Garrett admitted, as Becca agreed they'd like to distance themselves from the spotlight. "I love Reno and the Tahoe area, and she loves Minnesota, but we wanted to try somewhere new together." Becca also told ET that she was excited to live somewhere new "for a little bit" and Garrett luckily has family members living close by.